Are you in the market for new demolition tools and accessories? U.S. Diamond Tool has you covered! For more than 40 years, we've been a trusted supplier of scaling tools, chisel tools, cold chisel tools and other high-quality demolition accessories. Every item in our lineup is drop-forged from high-grade steel for superior efficiency, effectiveness and durability, so you can invest your money with confidence. Thanks to our handy online store, you can quickly zero in on the demolition tools you need, place your order, and have it on hand in no time. That sure beats going from local store to local store! By shopping U.S. Diamond Tool for demolition tools, you can rest assured that you're getting the very best. 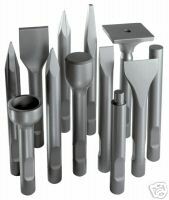 Whether you need new tools for channeling concrete, chipping concrete, scaling concrete, removing weld spatter, or for similar purposes, you’ll find what you need at prices you can afford at USDiamondTool.com! Businesses like yours depend on us for high-quality demolition tools, including scaling chisel tools, because we're dependable, affordable and deliver exceptional customer service. Why settle for less? Each item includes an in-depth description and clear photos.